Caudalie Crushed Cabernet Scrub is the first step in the Caudalie Slimming Regimen that can provide extraordinary results of up to 3.8 cm from the thighs. 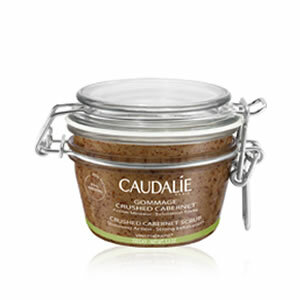 Caudalie Crushed Cabernet Scrub is the perfect body scrub for all who seek a strong exfoliation coupled with a slimming action. With its coarse granules, this scrub leaves the skin ultra soft and nourished and is a real booster to the Slimming Regimen, containing the 6 draining and cellulite-fighting organic essential oils of the Contouring Concentrate. Simply apply twice a week onto wet skin and massage onto the entire body, paying particular attention to the stomach, hips, and thighs, then rinse thoroughly.